Some of the finest masters of sand sculpting compete in this crowd-pleasing, weeklong event. 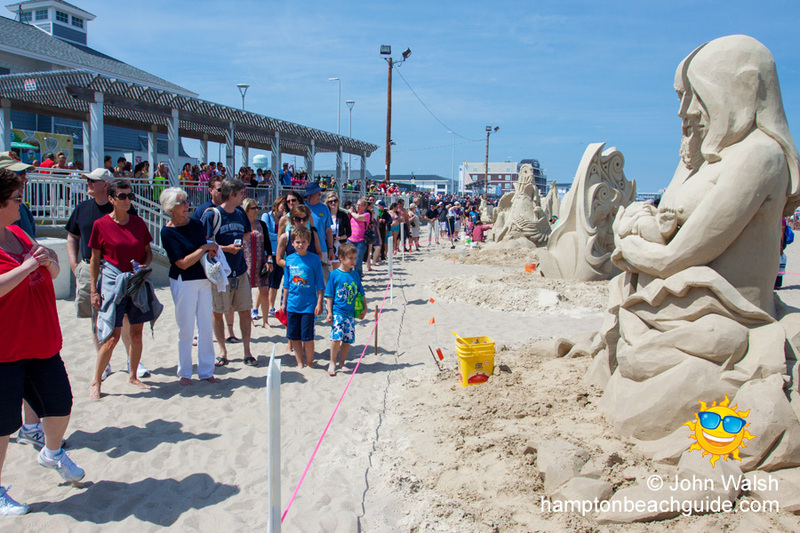 If it’s the middle of June, watch out as they will be dumping over 300 tons of imported sand onto Hampton Beach as more than a dozen world-class sand sculpting masters compete in the largest even of its kind in the Northeast. It’s the annual Master Sand Sculpting Competition that was started in 2001. This invitation only competition is sponsored by The Hampton Area Chamber of Commerce and The NH Division of Parks and funded by the Hampton Beach Village District. Greg Grady, the master sculptor who started the event, still serves as its organizer. About a week after the sand arrives, the complex and expansive sculptures are finished and judged, and because they are treated with a preservative solution of glue and water, the magical creations stand for well over a week despite wind and rain. Millions descend upon Hampton to watch the artists work their magic and to view the astounding works of art. There’s a People’s Choice Award, Sculptors Choice Award and First through Fifth-Place prizes. The public also has the opportunity to sign-up for sand sculpting workshops. This is one of the most popular events on the beach.